Aventi KP Nutritional Supplement can help support cats throughout the stages of kidney disease by preventing hypokalemia, replenishing the loss of B Vitamins, controlling metabolic acidosis and helping to reduce azotemia. Easy-to-use, palatable powder is sprinkled on the pet?s food. Reduces Phosphatemia: Calcium carbonate and chitosan act as binders to reduce intestinal absorption of phosphorus. Restores Acid-Base Equilibrium: Potassium citrate acts as a metabolic acidosis buffer. Helps Prevent Hypokalemia: Potassium citrate provides a safe source of potassium. 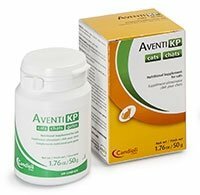 AVENTI KP cat powder is a nutritional supplement used alone or in conjunction with other renal therapies. Directions & DosageUse the measuring scoop (0.5g) provided. Mix AVENTI KS for cats with food according to the following daily amounts: Up to 2.5 kg / 5.5 lbs: 1 scoop per day; 2.5 and 5 kg / 5.5 and 11 lbs: 2 scoops per day; Over 5 kg / 11 lbs: 3 scoops per day. The daily amount can be divided into 2 or 3 feedings, according to the number of meals fed. Product blends best with moist feed. If feeding only a dry diet, slightly moisten the kibbles to ensure good adhesion of the powder and its complete intake. IngredientsMaltodextrins, fructooligosaccharide, citrus seed meal, dried Enterococcus faecium fermentation product, dried Lactobacillus acidophilus fermentation product, ascorbic acid, pyridoxine hydrochloride, folic acid, artificial meat flavor, vitamin B12 supplement. Product contains no meat based ingredients.